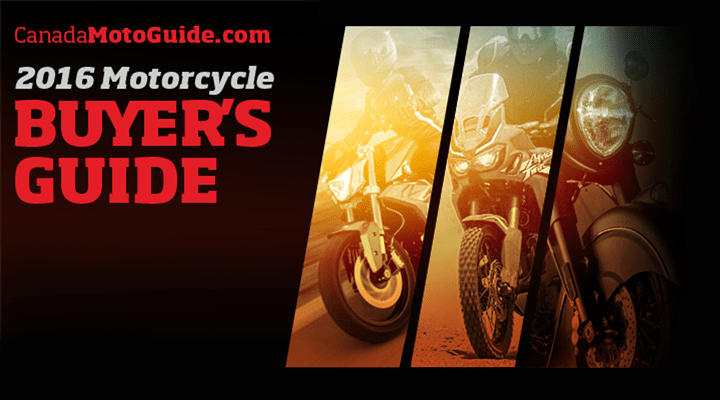 Welcome to the Canada Moto Guide Buyer’s Guide - your source for all the road-going motorcycles, scooters and three-wheelers available in Canada in 2016 and 2017. To get started you can choose by Brand or Category (below) or conduct a more specific search using the options in the header above. All the information in this guide is gathered from manufacturer’s press sites, public sites, international sites, emails and phone calls. Where we can we’ve digitally pulled the information directly to ensure data integrity. However, some missing data has been manually added or is sometimes erroneous from source. Also pictures may be european spec. In short, although we have done our utmost to get the guide 100% accurate, errors may occur. If you find any, please let us know so that we can fix it.